Sigma has confirmed that it would like to produce lenses for the Nikon 1 range of compact system cameras, but it needs the tech from Nikon to do so. It's only recently that Sigma has moved into offering third party lenses for compact system cameras, with the introduction of two new lenses (30mm and 19mm) for Micro Four Thirds and Sony E-mount cameras. These were only possible because the Four Thirds standard (which is used by Panasonic and Olympus) and Sony released the information needed to produce third party lenses. Other manufacturers, including Tamron and Tokina have also announced their intention to produce Micro Four Thirds lenses, while Samyang has also manufactured a manual focus fish-eye lens. Sigma manufactures a wide number of third party lenses for DSLRs, including Canon, Nikon and Sony mounts, along with optics for its own range of cameras. Traditionally, the third party lenses are cheaper than the equivalents in a camera's own range. Speaking to TechRadar, Graham Armitage, Sigma UK managing director said, "We'd like to provide lenses for everybody, but they [Nikon] haven't released the tech yet." "It will also depend on how successful the initial two lenses perform as well." Armitage also told us earlier in the week that he wasn't entirely convinced that compact system camera owners went on to purchase additional lenses. 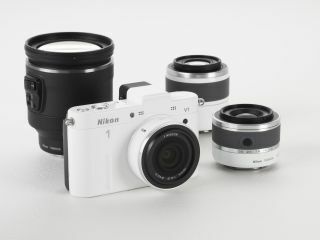 Currently, Nikon only has three compatible lenses for its Nikon 1 system, however any F-mount lens can be used via an optional additional adapter.